I'll be glad to help. The print settings might need to be adjusted. 2. What brand or model of label paper are you printing on? 3. What model printer are you using? As a quick test, I downloaded and installed the Hewlett Packard HP 4650 PCL5 print driver (version 61.071.661.41) on a Windows XP computer with AudioLabel Version 5.00 (Build 7). I took the following screenshot of the AudioLabel Print Dialog with the HP 4650 print driver and the Avery 5931 template selected. 1. If you click on the Preview button, does the print preview show the correct label image? 2. Is the Print Disc checkbox the only one selected under What to Print? 3. What option have you selected for the Disc Layout? 4. Are there any print driver setting you might have changed that could affect this? 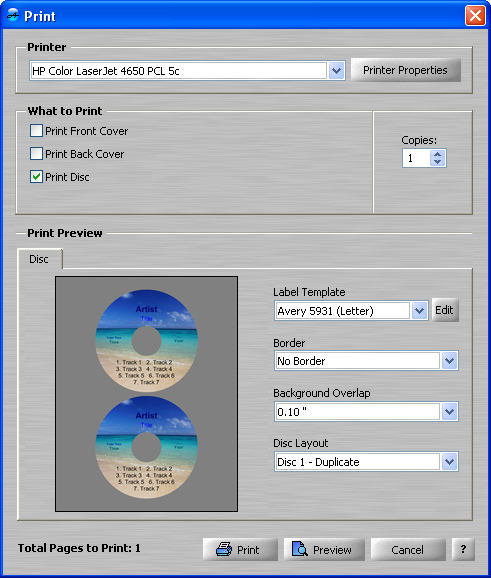 The Preveiw button shows the correct image and the Print Disc checkbox is the only on selected under What to Print. I think the problem might be the print driver settings. Please start AudioLabel and open the Print Dialog. 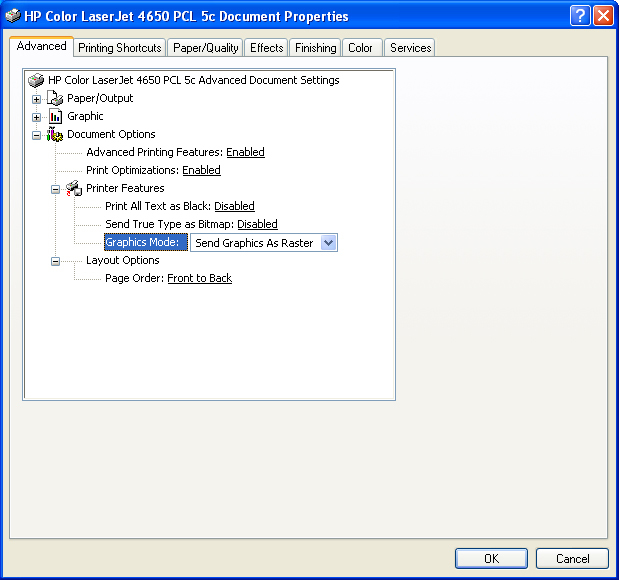 Make sure the HP Color Laser Jet 4650 PCL 5c printer is selected, and then click the Printer Properties button. From there, click the Print Driver Properties button, which opens the HP 4650 print driver. There is a print driver option called Graphics Mode that should be set to Send Graphics As Raster (as show below). After changing this option and pressing the OK button, please try printing again.